Below are listed free RSS tools. Free service provided by Google. Page2RSS is a service that helps you monitor web sites that do not publish feeds. It will check any web page for updates and deliver them to your favorite RSS aggregator. The Google goal: RSS updates provided every 2 hours. Free online service. Feedity is an RSS generator for web pages without a web syndication format. Feedity, RSS Web Feed Generator for Web Pages without Syndication, Convert any web page to a RSS web feed. Free online service. Your favorite site doesn’t provide news feeds? This free online service converts any web page to an RSS feed on the fly. Takes an RSS feed and turns it into an HTML page. You can either run it online, or put the php script on your own Web server. This is one COOL program. Free online service, or use on your own Web server. This can be used online or on a server, if you have access to one. 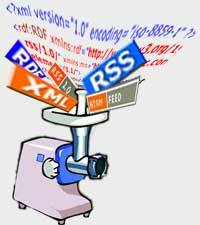 RSSgenr8 is a hosted HTML to RSS Scraper Tool which dynamically generates a RSS feed from any HTML web page. Use if you have access to a Web server. zFeeder is a PHP script used to display RSS content. Free plug-in for Firefox that lets you create and maintain your RSS feeds using your browser. This really works, and is one of the few programs that let you GENERATE your own RSS, too. Use if you have access to a Web server. lastRSS.php is simple yet powerful PHP class to parse RSS. All you have to do is understand how the heck it works. Use if you have access to a Web server. SimplePie is a very fast and easy-to-use class, written in PHP, for reading RSS and Atom syndication feeds. For Mac and PC, although I would not recommend it for Mac OS X. You use a Web browser and this program to produce RSS feeds, which you then upload to a Web server of your choosing. Besides the RSS Editor program, this one of the few programs that let you GENERATE your own RSS, too. This program is a little old, and those who love Perl will especially like it. Try this if you want to create your RSS feeds manually. This is a tutorial for using a low-tech, but effective, way to create your own RSS feed. After you’ve created you RSS feed, use an FTP program to upload it to your favorite Web server.